Two second-half goals from substitute Nasser Maher and Tunisian left-back Ali Maaloul earned Ahly a deserved 2-0 home win over 10-man Vita Club in their opening African Champions League Group D game on Saturday. 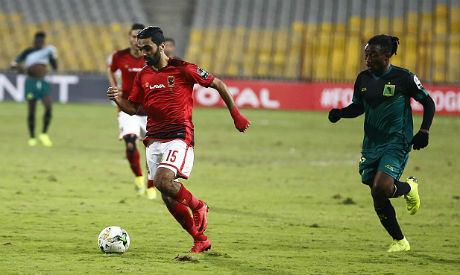 Vita Club, who survived a barrage of attacks in the first half as Ahly relentlessly pressed from the outset, had to play with ten men for more than 50 minutes after Dharles Kalonji, who was booked earlier, received his marching orders for a reckless foul. The DR Congo outfit's resistance ended when playmaker Nasser Maher opened the scoring five minutes past the hour mark, shortly after replacing lone striker Marwan Mohsen. Mohsen was substituted after picking up an injury, mounting the problems of the injury-hit Ahly and leaving the team without a single out-and-out striker in their squad. Maaloul converted a penalty 11 minutes from time to seal the win, Ahly's first in a group-stage opener in four years. The Red Devils, who lost in the Champions League final the past two seasons, are second in the group with three points, behind leaders Simba on goal difference after the Tanzanian side crushed Algeria's JS Saoura 3-0 earlier in the day. Ahly's Uruguayan coach Martin Lasarte gave a debut to record signing Hussein El-Shahat, who joined from UAE club Al Ain for a reported fee of $5 million, but he was largely ineffective. Vita Club were on the back foot for the entire first half, with Ahly launching a wave after wave of attacks. Malian defender Salif Coulibaly, who is set to leave the club this month, went close with two headers and winger Walid Soliman almost scored a beauty after nine minutes, flicking the ball over his challenger in the area before his weak effort was collected by keeper Nelson Lukong. Ramadan Sobhi, who is on loan from Huddersfield Town, wreaked havoc down the left with his tireless moves, but was often let down by the finishing touch. On 31 minutes, he skipped past his marker after a pull-back from Mohsen but another tame effort was easily saved by Lukong. Kalonji was dismissed a few minutes later for a clumsy challenge on Sobhi and Ahly remained in control, although they took their foot off the gas pedal for long spells after the break. In a rare foray forward for Vita Club, Ducapel Moloko fired over the crossbar from a tight angle but Ahly finally went ahead in the 65th minute. Right back Mohamed Hani's repeated cut backs caused constant menace to Vita Club and one of them eluded several defenders and fell to Maher, who made no mistake with a low shot from inside the area. Vita Club grew bolder after falling behind and at times looked like equalising, with Ahly keeper Mohamed El-Shennawi pulling off a save to deny the visitors a near-certain goal. However, Maaloul made the points safe with a powerful 79th-minute penalty awarded after Karim Walid was apparently brought down by Lukong, although television replays suggested that the substitute might have theatrically dived.